Tin Foil Hats Are Counterproductive. Really? As we near the apex of our political silly season, the final stretch of our presidential election cycle, it’s always fun to lighten up the mood a little. Where there’s politics, tin foil hats are near. It started with science fiction writer Julian Huxley who wrote a story called “The Tissue Culture King” (1927) where the protagonist discovers that metal foil hats “foil” the effects of telepathy. 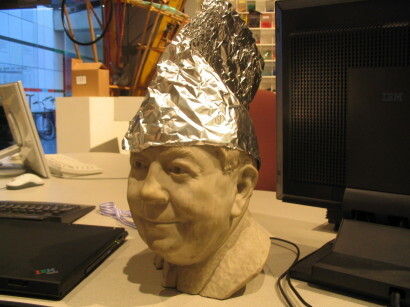 Since then the tin foil hat has become a metaphor for people suffering paranoia or those obsessed with conspiracy theories, specifically relating to government. This concept has become so pervasive in our culture that a team of students from MIT in 2005 published a study called “On the Effectiveness of Aluminium Foil: An Empirical Study.” It’s worth a second look. They used three different (and creative) tin foil hat styles, the classical, the fez and the centurion. Measuring different frequencies with a network analyser they came to a stunning conclusion. Not only did the tin foil hats fail to attenuate any frequencies, instead they amplified the bandwidths commonly used by the government. The surprising conclusion is that tin foil hats help the government spy on you. Somebody had to do it. We only wish they had submitted their poster to the Cureus Fall 2012 Poster Competition.